New York-based Japanese artist Yasuyo Tanaka has her artwork on display in two different exhibitions in the city. First, her work is on view in the Scholarship Show at the Manhattan Graphics Center. The show opened Saturday, January 12. Her work all things are linked 311 was selected from more than 3,000 submissions for the International Print Center’s exhibition New Prints 2013/Winter, consisting of more than sixty projects by artists at all stages of their careers. The exhibition of etchings, lithographs, books, and sculptures runs from Friday, January 18 through Saturday, March 9. It will then travel to Art League Houston from June 21 through August 2. Tanaka says, “I use my artwork as a key to understand others and myself.” A bookbinder and papermaker, Tanaka served as the book conservation technician at the libraries of the New York Botanical Gardens and Union Theological Seminary. Her pieces were originally made for her show Regeneration: Listen to the Voice of the Dawn, which was held at the Azabujuban Gallery in Tokyo last year. all things are linked 311 is about the relationship between nuclear power stations and atomic bombs. 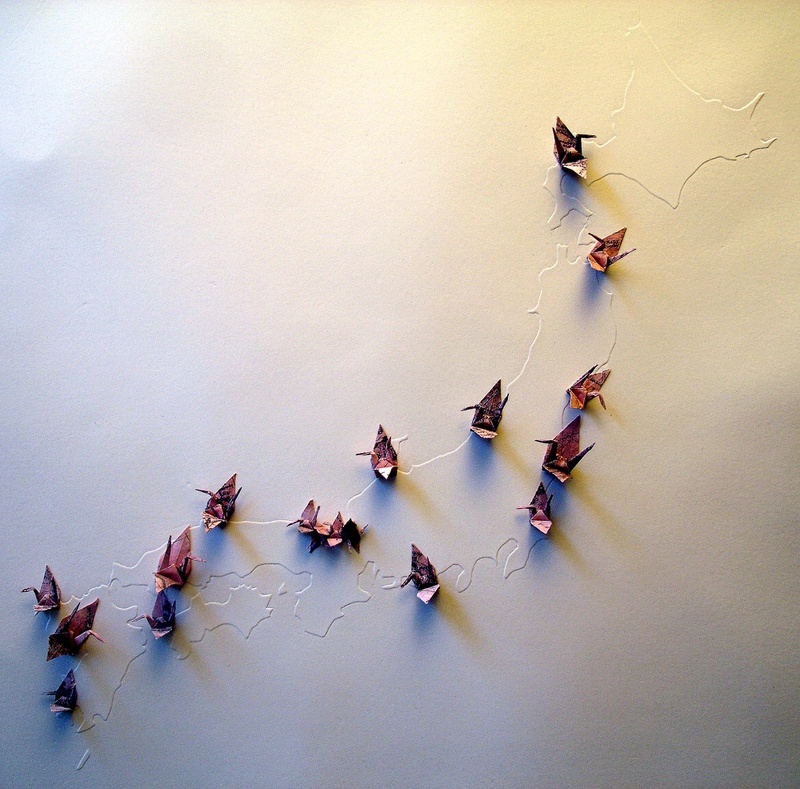 In the work, paper cranes dot an all-white map of Japan, marking the locations of Japan’s nuclear power plants, as well as Hiroshima and Nagasaki. In addition to her artistic pursuits, Tanaka is involved with the group the Manhattan Project to facilitate open discussions about the world’s nuclear situation.